Love one another is a challenge in a world where Christ’s love is greatly needed and sometimes so rarely seen. But this call to give hope and forgiveness, comfort and support as Jesus gives them is possible, especially once we draw from the great love that Jesus has for us. 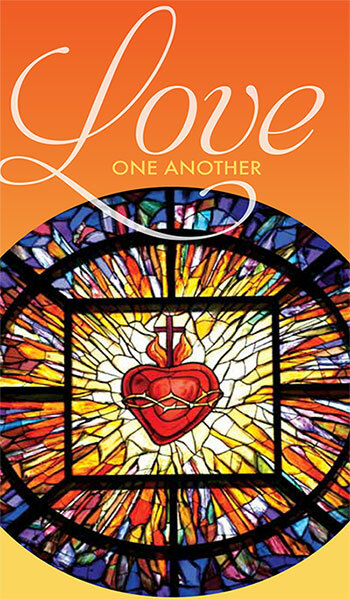 The Diocese of Rockford provides ministries and programs that share Christ’s love with others. 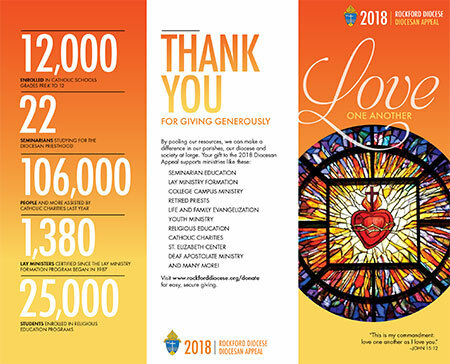 Your generous support of the 2018 Diocesan Appeal will help Jesus’ love to be known and imitated in the Rockford Diocese. 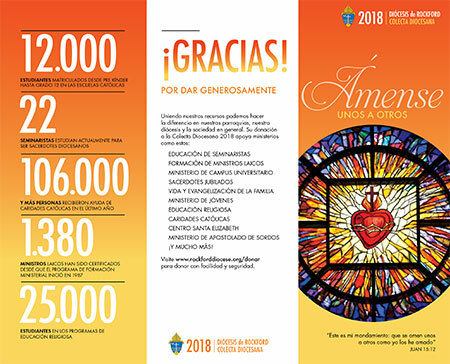 Funds raised through this appeal serve people of all ages through a number of parish-based and diocesan-wide ministries and programs. Your support allows us first of all to educate and prepare our seminarians for ordination to the priesthood. These young men will help ensure the future availability of the sacraments of Jesus’ love, including baptism, confession and the unsurpassable gift of the Eucharist. This appeal instructs and trains permanent deacons. It supports the many programs for engaged and married couples through the LiFE Office. Youth ministers and catechists benefit from education and ideas for their parish programs for young people. Loving outreach beyond parish boundaries happens through our Catholic Charities offices in its work on behalf of people whose lives can improve with professional counseling, emergency services, advocacy and life instruction. A handful of other ministries to help us all love one another are provided through this appeal including prison and jail ministry, the deaf apostolate, college campus ministry, lay ministry formation and assistance to our retired priests. Sacred Heart and shine His light into the world.